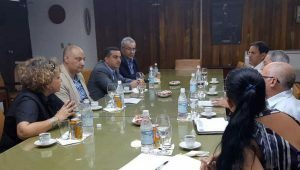 Head of the Department of International Relations at the Cuban Communist Party’s Central Committee Jose Ramon Balaguer reiterated his country’s support for Syria in all fields, foremost in its war against terrorism. Meeting Information Minister Imad Sara on Wednesday at the Committee’s headquarters in Havana, Balaguer praised the Syrian army’s sacrifices in fighting terrorism and aborting the conspiracy against Syria. Minister Sara, for his part, said the army’s successive military wins have paved the way for jump-starting the reconstruction process and pushing the political process forward. Syria’s national media has stood up to a media war waged against the country since the start of the terrorist war against it and managed to frustrate its goals, Sara stated, lauding the support to Syria by friendly media outlets which took it upon themselves to convey the facts about the Syrian situation to international public opinion.